The Rock Garden is a performance-oriented music experience for student musicians of all ages. Our philosophy is to celebrate the joy of music-making in a rigorous yet non-competitive environment. We offer programs of study year-round, including our Summer Rock Camps. For more information please contact us by filling out our contact submission form or by phone at 215-266-8658. Thank you for your interest in The Rock Garden experience. 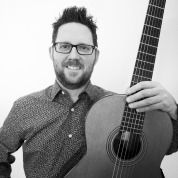 Our Founder and Director is musician/guitarist Peter Delaplane. Peter has been performing and teaching music in the Philadelphia and surrounding area for 20 years. He earned degrees in English Literature from Kenyon College, and in classical guitar performance from the Boyer College Of Music at Temple University. He is the founder and musical director of The Rock Garden, a summer music program for 8-18 year olds. In addition to maintaining a private teaching studio, he is a resident guitar instructor at Germantown Friends School and The Episcopal Academy. He has taught music at Friends Select School and Abington Friends as well as having served as a faculty member of Settlement Music School and The Nelly Berman School of Music. In addition to playing classical and finger style guitar, Peter enjoys playing in his folk rock band THUNDERBUS! (www.soundcloud.com/thunderbusmusic) , and recording and producing in his home studio. Peter's artist website is: www.peterdelaplane.com. For any questions regarding The Rock Garden, and programming please contact Peter at: peterdelaplane@gmail.com, or info@rockgardenmusic.org. We look forward to working together! to register for any of our programs, including private lessons or our summer music program, please contact us through the tab above, or call us at 215-266-8658, and we'll be happy to help you register!